On the first day of the UK’s Farnborough International Air Show, Burloak Technologies of Burlington, Ont., signed a Memorandum of Understanding to become one of the first companies to join its newly launched Manufacturing Partner Network (MPN). As a launch partner for the MPN, Burloak, a division of Samuel, Son & Co., will work closely with GE Additive to accelerate the use of additive manufacturing technologies across a number of market segments, including aerospace. Burloak will invest in GE Additive equipment, materials, software and technology and use them as a development platform to scale production and industrialization of all work referred through the MPN. “We’re delighted to have Burloak Technologies join as one of the first partners in our MPN. We continue to be impressed by their vision and strategy for additive and their business. They have big plans and we’re looking forward to supporting them as they grow,” said Jason Oliver, president and CEO, GE Additive. In May 2018, Burloak announced the establishment of its $104 million Additive Manufacturing Center of Excellence in Oakville, creating 65 new jobs and retaining 16 positions. The centre is being built with $7 million of support from Ontario’s Jobs and Prosperity Fund. The Additive Manufacturing Center of Excellence, according to Burloak, will provide every service required to move customer projects from concept to optimized design for additive manufacturing (DFAM) to full-scale production in a single location. The centre is expected to be fully operational in the first quarter of 2019. 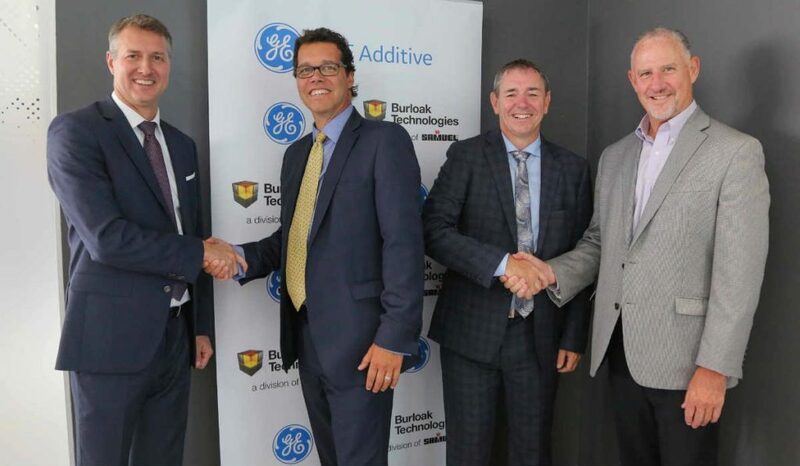 As part of the new MPN agreement, Burloak will also serve as a materials development partner to GE Additive to accelerate new material qualification and parameters.